Thank you to all who participated in our latest stair design photo of the month competition. 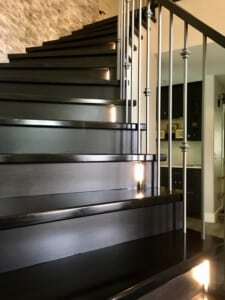 This month’s winning staircase was submitted by our Arizona team, and it was part of a complete home remodel. The stunning curved staircase is shown below. This project was completed for a residence in South Central Phoenix, Arizona, and was a collaborative effort between many members of our Arizona team. First, the stair was sold by Stephen Pawletzki, and it then transitioned into the hands of Will Alcorn, the project coordinator. It was installed by Daniel Damian and the material finisher was John Budai. 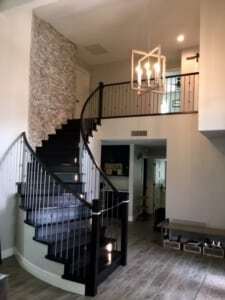 To complete this breathtaking curved staircase, the team used maple treads with a midnight black finish, a maple vista rail, mission style newel post, and iron balusters with an ash gray powder coat. One of the most striking features, however, is the LED light detail designed by Will Alcorn. 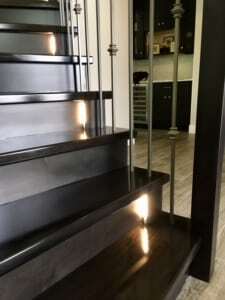 This unique feature, paired with the iron balusters, creates a modern design look that carries throughout the newly remodeled home. A well-designed curved staircase offers much more than its functional purpose. In fact, a staircase is an integral facet of design, a focal point, and often the first piece of furniture seen by visitors. 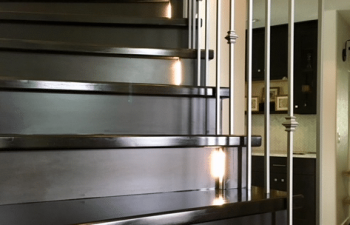 Beautiful and complex, curved stairs are considered the pinnacle of stair craftsmanship, and our team of talented professionals has the experience, capabilities, and skill to deliver the highest quality custom curved staircase, from inspiration to installation. Experts in building codes and regulations, our team will ensure that your curved staircases are code compliant and perfectly constructed. Once all drawings have been approved, our craftsmen will build the stair carriage in our state-of-the-art facility, complete with finished treads, risers, and skirt boards. Following the construction phase, we offer several installation options in order to best meet your needs. Through our comprehensive installation service, our team delivers and installs the staircase and handrail. If preferred, we can crate and ship the components to the jobsite via common carrier. We also offer a popular pre-fit handrail kit solution which makes handrail installation a breeze. With either option, we guarantee that your project is delivered on time and safely, with turn-key installation processes. Visit our curved staircase and modern railing design gallery for additional product photos and details.